One hotspot for new construction work which is set to gather momentum this year is the area around Cambridge in the East of England. The buoyant local economy which has generated significant new construction work on the city’s science and business parks is also creating some significant commercial projects. A recent review of the outlook for real estate in 2019 from Aviva Investors, one of the UK’s largest fund managers, identified Cambridge offices as one of the most promising markets for rental growth over the next five years. Bolstered by continuing growth, the fund manager believes Cambridge is one of the UK cities where prime property assets will remain in demand. Aviva Investors says that the most successful cities are those able to act as ‘crucibles of ideas’, where economies benefit through sharing information. Cities such as Cambridge which have these characteristics – Manchester and Birmingham are also mentioned – stand to benefit from knowledge networks and good transport links. Cambridge will also gain from development on the Oxford-Cambridge arc where the government is planning a new expressway and the re-opening of rail links between the two university cities. Some significant new construction projects are taking shape around Cambridge which are helping to keep major contractors busy. Earlier this month, Bouygues UK started work on a new £300 million physics and facilities hub at the University of Cambridge’s Cavendish Laboratory. Work on the 34 000 sq m block will continue until Spring 2022 (Glenigan Project ID: 15176972). Bouygues UK recently completed the city’s biggest office complex, The Triangle, a 360,000 sq ft, five-storey office building and tower on a former Cambridge University Press site, which is the new HQ for Cambridge Assessment. More new commercial construction schemes are in the pipeline, particularly in Cambridge’s central CB1 area, where Microsoft has a research lab and Apple and Amazon have bases. 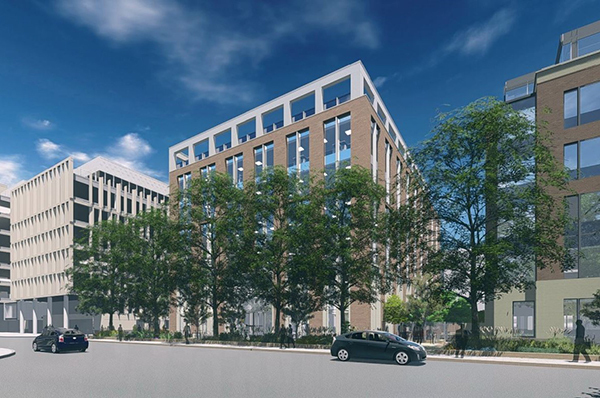 Glenigan Construction data shows that detailed plans have been granted and bills called on Brookgate CB1’s new £21 million office development near to the city’s main station. RG Carter is in talks on the project and work is set to start next autumn and run for 16 months (Glenigan Project ID: 15276285). As the area’s population grows, investment in schools is increasing. Construction work has recently started on the £44 million Northstowe Education Campus near Cambridge where Kier Construction is the main contractor and work is set to run until autumn 2019 (Glenigan Project ID: 17142822). There are also some major construction projects in the pipeline around Cambridge. Before Christmas, government funding was announced for a £100 million new children’s hospital to be built near the city’s Addenbrooke’s Hospital. Meanwhile, the Chinese group Huawei Technologies (UK) Co. has bought land for a £50 million research and development campus at Sawston, near Cambridge. The project is at the pre-planning and pre-tender stage and work is set to start from spring 2021 (Glenigan Project ID: 19017368).